Images from YouTube Comedy Features Louis C.K. What do you do when you realize a dear friend is a serial sexual harasser? 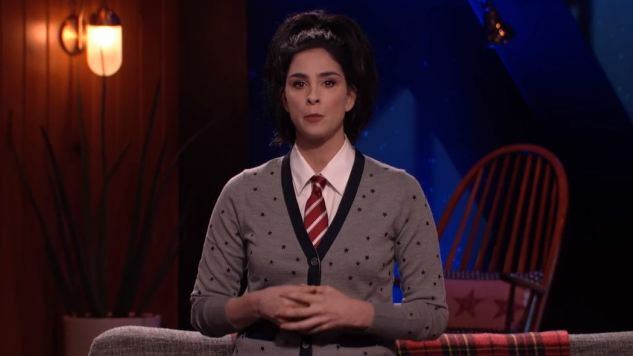 Like many comedians, Sarah Silverman has had to deal with that issue over the last week, as long-standing rumors of Louis C.K.’s sexual misconduct with various women have been confirmed. She’s remained silent since the news broke, but finally addressed the situation last night in a solemn monologue on her Hulu talk show I Love You, America. Some former fans were able to immediately wash their hands of C.K. For others it might not be that easy—if you chance upon his stand-up or episodes of Louie (which, admittedly, will be very hard to do today) you might find yourself recalling how much you enjoyed that work at the time before you remember what we now know about him. No matter how much you loved his stand-up or TV show he’s still just an entertainer and a celebrity to the vast majority of his audience, though. Viewers might feel closer to him than other actors because of the nature of his comedy, but his fans really don’t know him any better than they do any of the other people they see on TV. Silverman, though, has been friends with this guy for decades. She knows him as a “heartwarming” friend and a “great dad,” which she admits in this monologue is “totally irrelevant.” She does not try to defend or redeem him in the least. Instead she shares the emotional turmoil that one goes through when they realize that a good friend can be a very bad person. And she does that without making herself a part of the story of C.K.’s abuse—as she says, “The only people that matter right now are the victims. They are victims and they’re victims because of something he did.” She continues, “I hope it’s okay if I am at once very angry for the women he wronged and the culture that enabled it, and also sad, because he’s my friend.” It’s a sad, moving, candid reaction from somebody who’s been hurt and disappointed. And it’s entirely understandable that someone who’s been as close to C.K. for so long would be at a loss of how to react to this news. Silverman isn’t the only one of C.K.’s friends to openly wrestle with his harassment. Marc Maron, who has had a troubled relationship with C.K. over the years, has also had to publicly weigh the length and strength of his personal friendship with C.K. against the morality of standing by a habitual abuser who refused to acknowledge his behavior until the media reported it. Bill Burr, another stand-up from C.K.’s home region of New England, came under fire for saying on a recent podcast that he thinks C.K. will be able to quickly return to his career. These are all people who knew him personally for decades, who must’ve heard all the rumors about C.K.’s behavior that circulated online and within comedy circles, but who probably didn’t want to believe it due to their friendship with him. What C.K. did to those women over the years was abhorrent and disgusting. He’s paying the price for that professionally, and despite what Burr said, it’ll take a long time for C.K. to return. He’ll never reclaim his status as the biggest and most respected comedian in the business. He deserves that punishment, bringing it upon himself with his own actions. Meanwhile his victims saw their own careers hindered or even preemptively ended due to what he did to them. They never had the opportunities C.K. and other comics had, because his abuse put them in an untenable position with the biggest comic and one of the most important managers and producers in comedy. And on the sidelines you have people like Silverman, C.K.’s friends and colleagues who either didn’t know or, to be less charitable, didn’t care to know the scope of his misdeeds. They aren’t victims, but they still have to cope with the stress, pain and disappointment caused by C.K.’s actions in a way that others can’t fully understand. Silverman could’ve earned the respect of many by publicly writing her friend off, making a firm stance that this kind of abuse completely destroys whatever personal history they might have. Instead she offers a more powerful and vulnerable statement, affirming that that personal history is gravely damaged by these revelations, but sharing the pain and confusion that most people would feel when they learn a close friend could commit such acts. Her refusal to immediately and completely write C.K. off might anger some, but it’s honest, and honesty is something we need more of in today’s world.